Road works are often a problem for people cycling. 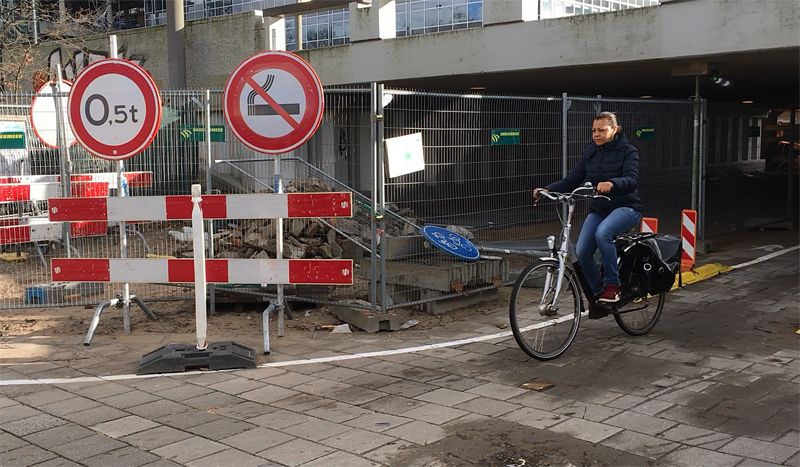 Luckily road managers in the Netherlands dislike the “Cyclists Dismount” signs almost as much as people on bicycles do. So, they go out of their way to make it possible for people to keep on cycling, even when there are massive construction works going on. In Amsterdam that should be taken quite literally. The entrance to the actual parking garage part of the detour. 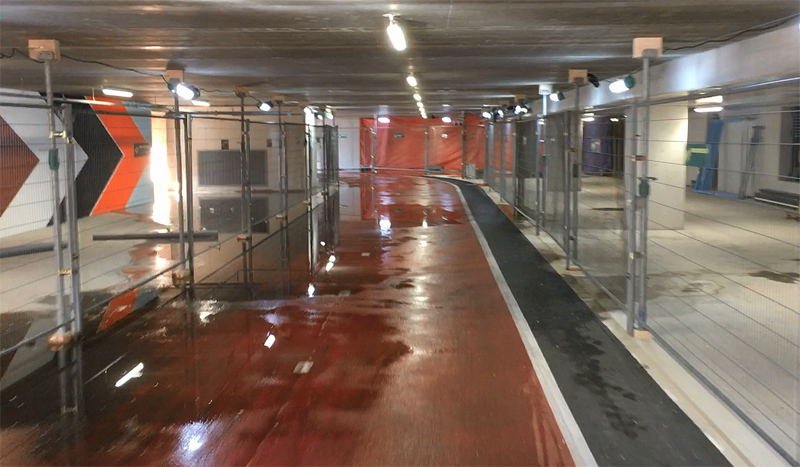 We can hope the contractor is also resourceful to solve the drainage problem: the parking garage was a little wet. 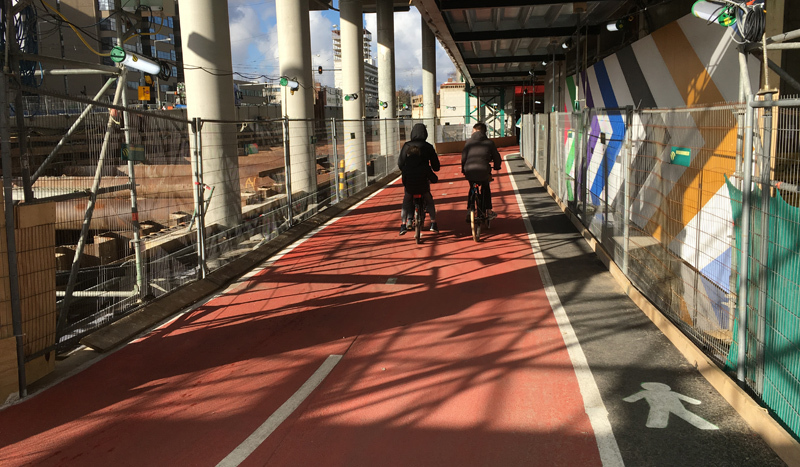 On the left hand side of these columns is where the cycleway normally runs. There is a deep hole there now. That hole is kept from caving in by large steel pipes. The south entrance of the detour. It is clearly visible that the building people cycle through here is still under construction. A ride through a building under construction in Amsterdam Zuid. 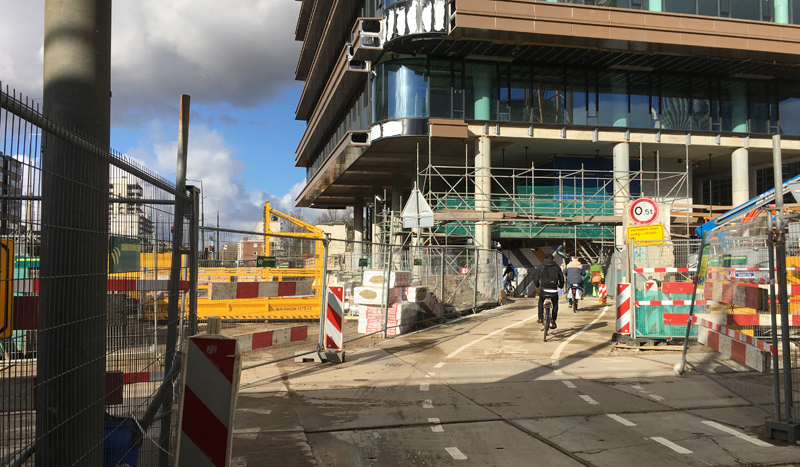 The development of The Amsterdam Zuid transport hub is massive. A video shows what is to be built here. This is not the only Amsterdam building you can cycle through. The Rijksmuseum has a cycleway going right through it, permanently. In Tilburg you can cycle through a former railway carriage maintenance building. The governor of California recently proposed additional taxes on gasoline and vehicle registration to go towards roads throughout the state. This is the equivalent of $500 million per year for the city of Los Angeles. Which is about 50% more than the upcoming $1 billion in sales tax to be devoted to transportation in the city of LA, That is about $350 for every man, woman or child.. There would be enough money for the city of LA to build cycle tracks to the equivalent quality that there is in the Netherlands.Green asphalt? No problem. Ped/cyclist tunnels and bridges? A piece of cake. New curbs and sidewalks? That will be a standard operating procedure.every time the street is repaved. Nice work by the contractor. Presumably the cyclepath is well-lit at night too. The smoking ban – is that a thing on all construction sites in NL or perhaps just indoor sites? In Australia where I live I’m not aware there is even a partial ban, although it may be the case as I haven’t been on an indoor site in several years. My experience of the NL is that smoking is “tolerated” more than it is in Australia and that cigarettes were quite cheap to buy, which I suspect goes some way to explain why the Dutch life expectancy (surprisingly, with all the exercise they get from cycling) isn’t much more than the rest of the “developed” world. The general rule in the Netherlands is that everybody has the right to a smoke free work environment. That means that you cannot allow people to smoke where other people are working indoors, or in the near vicinity of people working outdoors. In addition to that, there’s typically a relatively strict smoking ban on building sites due to safety. Wood dust, acetylene tanks, plastic packing materials: you typically want to keep sources of ignition to a minimum. Thanks Jan for the reply. That all makes sense. Dutch building sites, at least in all of Mark’s videos, always look very tidy and safe, and the workers all seem content as they calmly go about their work. Happy Dutch workers seem to deliver large projects for an economical price too. I believe this is another thing the rest of the world could and should learn from the Dutch. Given that this is Amsterdam, the question arises, in the parking lot it is a ban on smoking what exactly? A more entertaining video from last Sunday’s CicLAvia event. 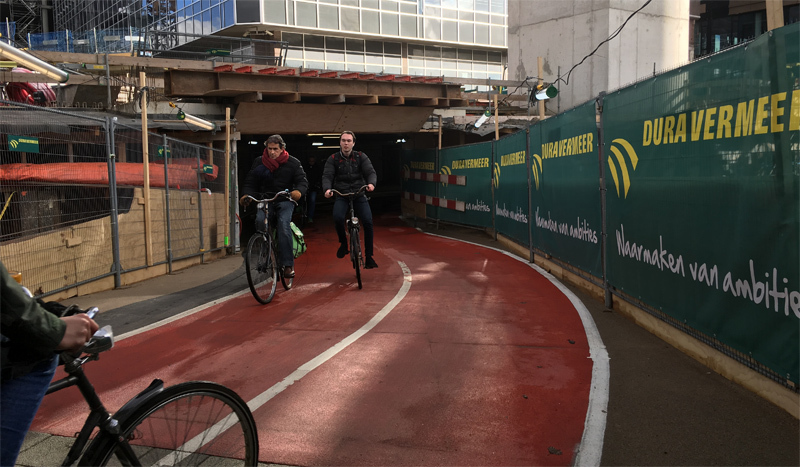 – Because of the construction of the new court, there is a second detour on the other side of the parnassusweg, where the cyclists are led over the Parnassusweg (sacrificing one traffic lane) instead of through the tunnel opposite to this one. I can’t believe I had my corners so mixed up! I changed the text to reflect the actual situation. Where I said NoMa house before, I now correctly refer to the Atrium building. Thanks! 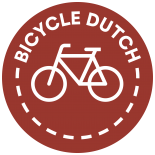 This entry was posted on 28 March 2017 by Bicycle Dutch in Original posts and tagged Amsterdam, detour, road works.